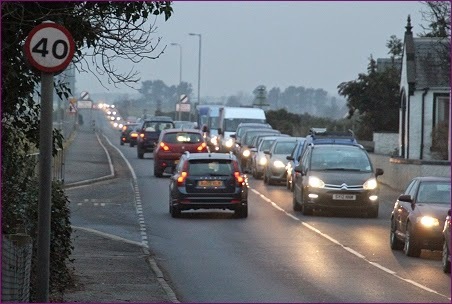 It could be that broken down vehicles were to blame for the traffic jams through town this afternoon and early evening. One of our regular readers abandoned her car near the Westerlea after the traffic just came to a standstill around 4.30 pm. There is a report on the facebook page "Remove Nairn Traffic Lights" that a broken down car was on the A96 next to Scotmid for some time around 3.45 this afternoon. 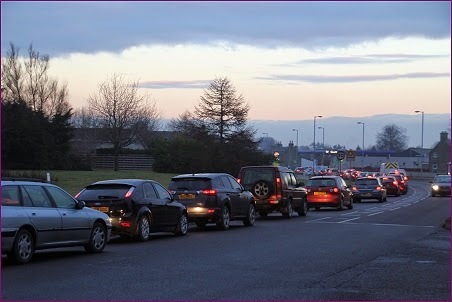 There is another report of delays before that however and traffic was still tailing back to Delnies at around five o'clock - another car had broken down near the West End garage. Video of the edge of town at that time here. Gurnites will recall that there were problems yesterday afternoon too. Are breakdowns compounding or masking further dysfunctional traffic light behaviour or have we just had a couple of unlucky days? A video featuring the infamous broken down car at Scotmid has been posted here on Facebook. That Facebook video raises an interesting point. There were cars parked - quite legally, in marked spaces - on the A96 opposite the Bridgemill carpark/car wash. This narrowed the road just about where the car had broken down. If the parked cars had not been there, it would been perfectly possible for traffic heading eastward (towards Forres) to pull out and pass the broken-down car. That would have reduced, if not avoided, the 2-3 mile tailback through the town. The lights are headache enough. It does seem a bit strange that there are on-road parking spaces (which effectively reduce the width of the road by one lane) on the A96 trunk road - and right opposite a designated carparking area! Another question for Transport Scotland to answer. The "Designated car parking area" Is not for the houses across the road though, It is private land which I would assume would not allow householders to park there cars there. Plus If I owned bridge mill/ Morning noon and night I wouldn't want my car park full of cars that may sit there all day/all week without moving. But it misses the essential point: is it sensible, given the volume of traffic on the A96, for that somewhat restricted roadway, in a built up area, immediately adjacent to the traffic lights, to have private car parking on the public trunk road? There is no other such private parking anywhere else along the A96. What's more, if the presumed attitude of Bridgemill/Morning Noon and Night were to be adopted by, say, the Co-op in the middle of town, then there would be parking problems along other stretches of the A96 through Nairn as well!